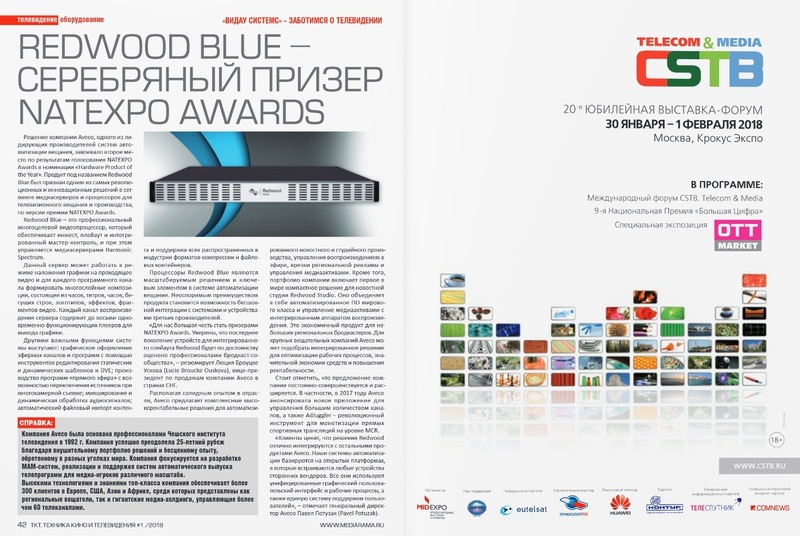 Prague, Czech Republic, January 10, 2018 - Aveco, the worldwide broadcast automation specialist, has been awarded second place in the “Hardware Product of the Year” competition for its Redwood Blue playout solution — as one of “the most revolutionary and innovative products” in the “video servers, storage, and other playout solutions” category at NATEXPO Russia in December 2017. Redwood Blue is a professional, multipurpose video engine powered by Harmonic Spectrum technology. It is designed for ingest, playout, and integrated channel origination. Features include eight layers of graphics, DVEs, live signal switching, audio processing, and up to four video channels of ingest and/or playout per chassis, which supports all major formats. Another big differentiator that grabbed the attention of the industry is the automation layer on top of Redwood Blue — the well known Aveco automation — that makes sure Redwood Blue can be plugged into any workflow and cooperate with any third-party device and system. “We are honoured that the broadcast community has nominated Redwood Blue, which is the newest generation of Redwood integrated playout devices, for this award,” said Lucie Broucke Ouskova, Aveco’s VP of Sales, CIS. Aveco has a well-established product portfolio of playout automation, automation for studio production, and media asset management solutions - with the entire portfolio being enhanced and upgraded continuously. For example, in 2017 Aveco introduced a new surpervisor application for managing large numbers of TV channels, as well as AdJuggler - a revolutionary way to monetize live sports at the MCR level. However, the year's biggest achievement has been the new generation of Redwood integrated playout devices. NATEXPO is an annual, international exhibition and conference focused on technologies, professional equipment and services for the Television, Radio and New Media Broadcasting and cinema production. This unique and largest event of its kind in Russia, is produced by the National Association of TV and Radio Broadcasters of Russia (NAT), the Eduard Sagalaev Fond of TV Broadcasting, Mass Media and Internet Technology Expansion and «ExpoNAT» Ltd. NATEXPO is providing an ideal platform for international business development and technology exchange as well as serving as the perfect gateway to the Russian market, both on a national and regional level, for equipment manufacturers, technology providers, content producers, channel suppliers and service operators.